I hate raisins. I consider myself pretty open minded when it comes to food, but raisins...guh! They are the one thing that I absolutely refuse to eat. The only exception is pickled golden raisins, but that's because pickles are more awesome than raisins are terrible. The absolute worst is when people sneak raisins into carrot cake. WHYYYY? They don't belong. Anyways, the point of my rant is that the original recipe for this dish called for golden raisins, but I subbed dried cranberries which made it infinitely better. I've actually made it a few times before with raisins and each time I ended up picking all of them out while eating. If you're not as neurotic and crazy as I am, feel free to use any type of raisin or dried fruit your heart desires. I also found this fancy hand rolled couscous at Whole Foods and decided to try it out. It is quite tasty, but oh boy, was it expensive. It's closer in size to Israeli couscous, not quite as large, and you still cook it up like regular couscous though it takes about twice as long. My verdict? Tasty, but not worth it at almost 3x the price of buying regular couscous in the bulk section. This couscous is one of those dishes that tastes better the next day. I highly recommend letting it sit for at least 30 minutes after making before eating. 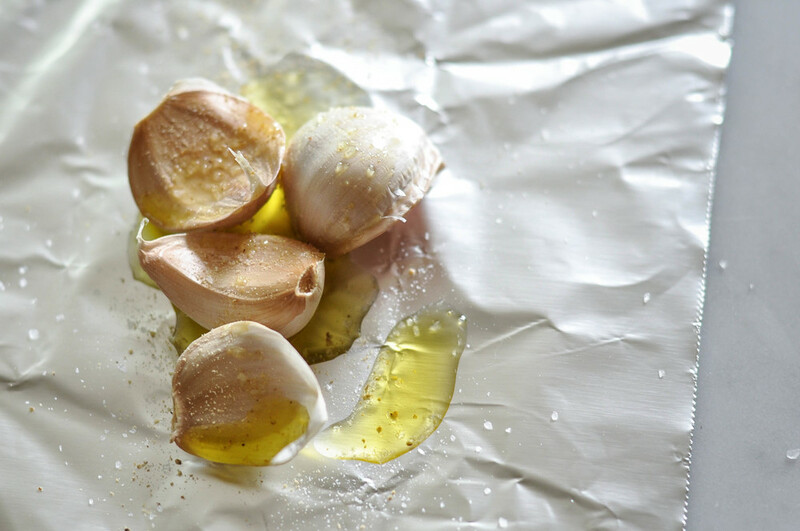 Place the garlic on a sheet of aluminum foil. Drizzle with just a hint of olive oil, salt and pepper if desired. Wrap up the foil and place in oven for 25 minutes. Meanwhile, bring water up to a boil and place in bay leaf. Once boiling, turn off heat, add couscous and give it a quick stir. Wait 5 to 10 minutes, depending on the type of couscous you're using. Once all the water has been absorbed, fluff couscous with a fork and set aside. In a large, heavy bottomed skillet, heat up canola oil on high. Transfer zucchini, squash, shallot, dried cranberries, cashews, chili flakes, and salt to the skillet and cook for 2-3 minutes, enough to give the vegetables just a little brown without overcooking them. Turn off the heat and let cool. Take the garlic out of the oven and let cool for a few minutes. In the meantime, mix lemon juice, honey, olive oil, and salt in a bowl. Once cooled, peel the garlic cloves gently, add to the vinaigrette, and mix it up until well incorporated (there should not be any large chunks). Transfer couscous and squash mixture to a large bowl. Drizzle in vinaigrette, add mint, and gently fold until combined.